Paul Johnson’s series of articles is inspired by his work as Warden of Crowhurst Nature Reserve, known locally by its catchier nickname, Quarry Wood. Paul has been energetically involved since the start of the project in 2000. He and his wife, Caroline, have lived in Crowhurst for twenty-something years and both of their children went to the village school. Paul grew up in Bexhill and moved to Edinburgh as a student before coming back to Sussex to raise his family. After years at the Ambulance Service, he now works at St Michael’s Hospice, but his true calling involves getting his hands dirty and his feet wet – he has a BSc Honours in Rural Resources and a Masters Degree in Biology of Water, and volunteering at Quarry Wood utilises this wealth of knowledge as well as fulfilling his interests and hobbies. In 2008, Paul began writing a column for the village magazine, Crowhurst News, which is published monthly (except for January and August); the articles on this website have all appeared there first. Although Quarry Wood is the central thread and star turn, his themes often range further, taking in ecology, botany, mycology, history, mythology, Latin and literature. All with a healthy dose of irreverence and the odd bit of Hitchhiker’s Guide to the Galaxy. Paul is also involved with other community activities, such as Crowhurst Community Arts (aka The Arty Farties, with gentle self-ribbing). He takes the lead on the nature-based events, including the Bluebell Walk around Forewood and the Fungi Walk around Quarry Wood. Crowhurst Nature Reserve is a four and a half acre community-owned woodland in Crowhurst (East Sussex), known locally as Quarry Wood. It was bought by the village for the village in 1999 to protect and preserve it. 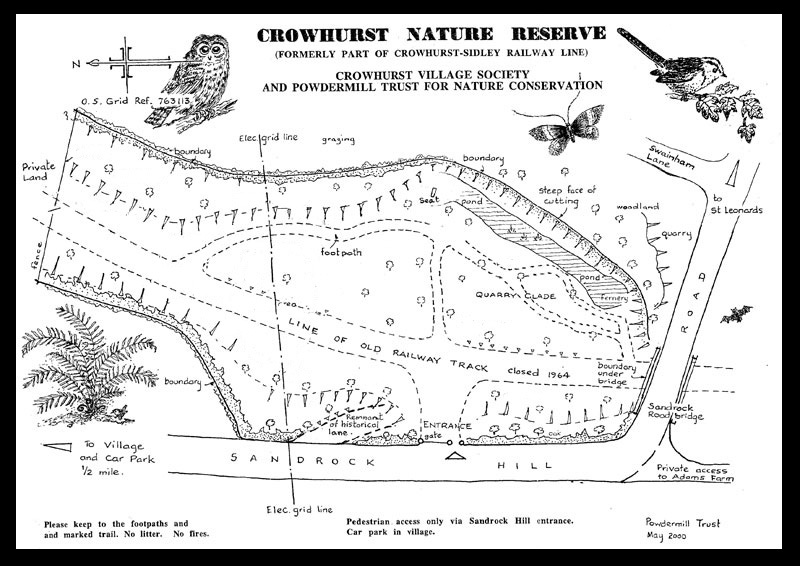 It is jointly managed by the Crowhurst Society and Powdermill Trust. This beautiful little wood is at the southern end of Crowhurst, on Sandrock Hill, on your left if you’re going towards Hastings. Click the sketch for an interactive map in a new window. Its history and shape are inextricably linked to the Crowhurst to Bexhill railway line, which ran through here from 1902 to 1964. Before then, the road had a much more gentle curve, and there is still a little of the old lane just inside the gate on the left. It is likely that it was the construction of the railway that put the “quarry” into Quarry Wood, with significant sandstone blasting and earthworks required to accommodate the train track. At the southern-most boundary, the striking Victorian brick arch bridge is a reminder of the railway, and the route of the track is evident in the straight tree-lined corridor. In the last eighteen years, the Reserve has been sensitively managed by a group of local volunteers: clearance to make it accessible and safe; creating pathways, benches and glades; nature-based community events; and an ongoing species-monitoring programme to gradually build the conservation portfolio. It has a highly regarded fernery and a superb diversity of fungi, the accredited moth list is growing, the pond is measured fortnightly, there is an Ash Die-back monitoring zone, and a new bird-watching area has just been opened up on the top tier. Many different birds fill the woodland canopy, and there is a plethora of insects and pondlife; there are resident rabbits, squirrels and badgers, and signs of foxes and deer passing through regularly. A beautiful little Nature Reserve, rich in history, geology, ecology, biodiversity, conservation, trees, birds, flowers and fungi … enjoy! Thanks for the follow at naturestimeline, Mr Johnson.